The Middle East is marked by various forms of state failure and strife, a situation that is unlikely to change in the foreseeable future. The region is also sorely lacking in its collective capacity to prevent and manage conflict. This report examines the recent history of the Arab League and other organizations to show that the absence and ineffectiveness of regional engagement in conflict prevention and management are not simply technical matters of capacity, but reflect broader geopolitical dynamics and the lack of political will within the region. It further argues that, in light of these realities, Middle Eastern countries and interested outside parties should focus near-term attention on a mundane and incremental approach to building capacity for conflict prevention. As recent developments make clear, it is possible that the region’s institutions will be called into action as its politics and security shift. The Middle East is marked by various forms of state failure, civil conflict, interstate tensions, and transnational threats, and that reality is likely to remain a defining feature of the region for the foreseeable future. The region is also sorely lacking, perhaps uniquely, in its collective capacity to prevent and manage conflict. A full-fledged regional security architecture that includes robust conflict prevention mechanisms has long been seen as a desirable goal. Nonetheless, discussions of this goal often have focused on the most ambitious potential outcomes of regional security dialogue, or have made success almost wholly dependent on major strides toward peace and security, which have obviously proven elusive. This oft-noted gap is both a function of reliance on external actors, particularly the United States, and a spur for still more outside intervention in regional affairs. In matters that may have material spillover effects on international security and global stability, major international players are likely to continue their extensive current involvement. Similarly, regional powers will continue to seek to maximize their independence and room for maneuver with respect to their most pressing regional priorities. However, many less far-reaching crises and disputes would benefit from early and effective regional engagement. Further, productive regional involvement could provide support for international and multilateral diplomacy and conflict prevention, management, and resolution—even when it comes to the most serious international crises emanating from the Middle East.1 Such initial regional efforts might also provide the basic structures and mechanisms around which a more formalized regional security infrastructure could be built. The absence and ineffectiveness of such regional engagement mechanisms are not simply technical matters of capacity, but reflect broader geopolitical dynamics and the lack of political will within the region. As such, the matter of building greater capacity itself is a political choice. However, even this highly constrained environment presents opportunities for regional efforts at conflict prevention, management, and resolution—and yet the lack of institutional capacity may make it difficult to grasp these fleeting openings. With these limited openings in mind, willing countries in the Middle East and interested and influential outside parties should focus near-term attention on mundane, practical, incremental approaches to building conflict prevention capacity and mechanisms. Creating institutional links between the Arab League and other regional and international organizations, institutionalizing conflict prevention mechanisms, and undertaking more serious professional development and training are necessary (even if insufficient) steps to more effectively address regional conflict. A focus on even modest progress can have positive, practical impact. These efforts also could provide the initial building blocks for an eventual regional security architecture. Although such low-key efforts can never substitute for the major diplomatic and political decisions needed to begin a serious, sustained regional security dialogue and build effective security institutions, they remain a prerequisite to more ambitious future efforts and may promote the use of regional mechanisms to address regional crises and conflicts. More broadly, the Middle East will need major political, cultural, and diplomatic breakthroughs to produce durable regional security—narrowed sectarian animus and conflict, peace between long-term belligerents, a grand bargain that can move the region past the collapse of the postcolonial Arab state system—but such achievements are out of reach in the near term. Until and unless they become possible, plenty of useful work can be done to create incremental institutional and other capacities to prevent and manage conflict. At best, such measures can one day be the foundation of a new regional security architecture. But failing that ambitious outcome, the measures described below can yield significant accomplishments in managing simmering regional conflicts and containing their fallout. Any discussion of regional capacity and existing mechanisms for conflict prevention must begin with the Arab League, which offers a template for understanding the factors that constrain regional cooperation. Currently, the Arab League receives its most focused public attention when pictures emerge from its annual summit meeting of various leaders sleeping during the proceedings.2 This yearly occurrence and the derision it inspires are instructive and speak to the region’s fundamental lack of confidence in the organization and its mission. The League was established in 1945 and was the first such regional organization. Despite this longevity, its track record has been seen as underwhelming, particularly as other regional organizations in recent decades have gained greater coherence and provided a platform for greater regional cooperation. Arab League Secretary General Nabil Elaraby (3-L) and Libyan Minister of Economy Ahmad al-Kushali (2-R) attend the Arab economy, finance and trade ministers meeting as part of Arab League Summit at Ishtar Sheraton Hotel on March 27, 2012 in Baghdad, Iraq. The Arab leaders will meet in Baghdad for the 23rd regular session of Arab summit on March 29. Source: Ali Haider-Pool/Getty Images. Even this revisionist approach, however, suggests a modest record of success, but primarily reflects the limited number of disputes that its member states have been allowed to engage with owing to the procedural requirement for unanimity. Limited efforts have been made to build out the institutional frameworks for the Arab League’s peace and security activities, but these efforts remain stunted. Most notably, in 2006 the Arab League sought to emulate the reforms successfully introduced by the African Union by adopting measures to establish an Arab Peace and Security Council intended to prevent, manage, and resolve regional conflicts.18 These reforms would have established the Arab League as the primary forum for the settlement of disputes19 and theoretically represented a step toward greater institutionalization of its conflict prevention, management, and resolution mechanisms.20 The Arab Peace and Security Council, which Arab League officials saw as a potential complement to the League’s traditional reliance on the offices of the secretary general,21 was formally established in 2008. The Arab Peace and Security Council remains advisory in function, and as such, its recommendations are subject to Arab League Council approval; as of 2012, only twelve member states had adopted the new mechanisms.22 Further, some of the more focused innovations, such as the proposed establishment of a data bank, early warning system, and a “panel of the wise” (a selected group of experienced actors who are qualified and willing to act as conflict mediators) have yet to take shape. In sum, the reforms are mostly notional, but the resulting institutional steps nonetheless provide an existing basis and framework upon which reforms could be based if political will crystallizes in the future. In effect, the United States became a regional party by dint of its permanent and extensive presence, fundamentally altering the region’s security frameworks and relationships. That presence would expand further in the aftermath of the terrorist attacks of September 11, 2001, and the March 2003 invasion and occupation of Iraq. Despite the rebalancing of force allocation following the U.S. withdrawal from Iraq in December 2011, the U.S. military presence in the region has endured and has in some places deepened with the ongoing military operations against the Islamic State and other transnational terrorist organizations. This military presence shows no signs of disappearing any time soon, despite alarmist rhetoric about U.S. retrenchment and the abandonment of the region. In the immediate aftermath of the invasion, there was still a regional consensus for an Arab solution to the crisis.34 But despite crisis diplomacy and an Extraordinary Arab League Summit in Cairo on August 10, 1990, it became clear that the League lacked unanimity, and hope for a regional solution diminished as the Iraqi position remained rigid. As a result, the Arab League was not in a position to lead collective security efforts to deal with such a major violation of international law. Further, as the prospect of outside military intervention gained coherence, the divisions within the Arab League rendered it a bystander as the United States began its preparations for a complex multicountry military operation. Understandably, the considerable international interests at stake shifted the primary focus of the conflict to the UN Security Council (UNSC) and the United States. The war and its aftermath were a historical inflection point for the region, accelerating existing trends and exposing differing regional threat perceptions and interests. The failures of regional diplomacy to deal with and contain the crisis over Kuwait accelerated the reorientation away from meaningful regional diplomacy. Despite its well-deserved reputation for inaction, in recent years the Arab League has opportunistically broken with its orientation toward the status quo and the protection of state sovereignty. In the post-2011 environment, it occasionally has set aside its normal predispositions on sovereignty. At a time of regional upheaval, those policies seemed to be in keeping with the widespread (though not universal) public embrace of the uprisings and the political openings that they represented. These abrupt shifts on Libya and Syria saw the Arab League adopt activist positions on the internal matters of member states, and also paved the way for subsequent engagement and intervention by the international community. They did not, however, reflect evolving regional norms, but rather were attempts to harness momentary regional trends for geopolitical advantage.35 When the Arab League took action, it merely reflected its powerful members’ pursuit of their national interests, and not any change in the League’s own capacity or direction. In historical terms, the Arab League has not focused on the internal behavior of its member states and their approach to their citizenry—a hardly surprising choice in a region characterized by repressive, authoritarian regimes and widespread violations of rights.36 Notable examples of this avoidance include the League’s relative silence on the massacre of Islamists in Hama in 1982 by the Syrian regime of Hafez al-Assad, the atrocities committed by the regime of Saddam Hussein against Iraqi Kurds during the 1988 Anfal campaign, the indiscriminate violence unleashed by the Iraqi regime in its attempt to suppress and crush the antigovernment rebellions largely spearheaded by Shia and Kurds in the wake of the 1991 Gulf War, or the ethnic cleansing and crimes against humanity undertaken by Sudan in Darfur in 2003–4.37 However, in the face of a linked media environment and growing popular outrage at government reactions to the uprisings, the Arab League selectively engaged on two crises—Libya and Syria—that presented strategic openings for a critical mass of key member states. The hypocrisy of these steps is glaring when compared with how these same states, and the League itself, approached other uprisings, such as those in Egypt and Bahrain. In Libya in particular, there was no real discernible effort at conflict resolution. The widespread hostility to Muammar Qaddafi and his eccentric rule, coupled with the bottom-up pressures created by popular perceptions of the uprisings, produced unprecedented Arab League responses to the crisis that eventually would result in a UN–sanctioned no-fly zone. Following calls from Arab League secretary-general Amr Moussa for an end to violence, the Arab League moved rapidly to develop a proposed no-fly zone in early March 2011. At that point, the League still rejected the prospect of foreign intervention and suggested a possible no-fly zone jointly enforced by the Arab League and African Union. But this stance shifted rapidly in line with the policy preferences of the Gulf States, led by Saudi Arabia. On March 7, 2011, the Gulf States proposed a no-fly zone and called for an emergency meeting to discuss the possibility of an Arab League–backed no-fly zone. This was followed by an Arab League meeting that resulted in a call for the UNSC to impose a no-fly zone over Libya, which clearly played a major role in the latter’s eventual adoption of that measure. This activist approach to regional developments influenced the Arab League’s subsequent if more cautious engagement with the growing crisis in Syria. In Syria, as with Libya, the twin pressures of popular opinion and geopolitics came together to produce Arab League assertiveness. As described in more detail below, the Arab League’s hasty and flawed approach to the growing violence in Syria undermined the already dim prospects for effective engagement and intervention. In other circumstances in which the 2011 uprisings produced major political change in parts of the region, even these cynical steps could have created an important, replicable precedent for the League’s future engagements. But even though the uprisings produced their own form of regional cascade, their outcomes have been mostly disappointing and in many cases disastrous. In such circumstances, the Arab League’s moves have had limited effects and have not encouraged a major normative shift away from its emphasis on state sovereignty and noninterference. The selective focus in the aforementioned cases, driven by the preferences of key member states such as Saudi Arabia, the United Arab Emirates, and Qatar, nonetheless inserted the Arab League into regional affairs in ways that may affect the organization’s future. Despite these qualifications and the specific nature of the Arab League’s engagement in Libya and Syria, under certain circumstances even a hidebound and reactionary organization such as the Arab League may opt for more aggressive institutional actions. This possibility suggests that even the Arab League could find itself called upon to engage meaningfully in future conflict prevention and management. Although the Arab League displayed unexpected activism with regard to Syria, the short-lived and ill-fated Arab League Observer Mission in Syria was a poorly planned fiasco that highlighted the organization’s lack of capacity in conflict prevention and mission design. A former senior Arab League official described the planning process as “rushed and woefully unprofessional,” and lamented the mission’s desultory performance.38 He further elaborated that “capacity in this area is usually built on experience, which the Arab League as an institution has not been allowed to cultivate, and as a result there is very little pushing the organization to build that kind of capacity. And even if it did, it wouldn’t be used. It’s really a classic chicken-and-egg situation.”39 These bitter reflections encapsulate some of the challenges facing any effort to build conflict prevention capacity within the Arab League. However, this dilemma is complicated by the reality that when called upon in extremis, as was the case with the mission in Syria, the Arab League is not in a position to offer meaningful experience or engagement. In the months leading up to the dispatch of the observer mission, the League engaged constantly with the Assad regime and made increasingly harsh public statements calling on it to end the violent crackdown against protesters. The League drew up a peace plan and set a deadline, but then offered multiple extensions to its multiple ultimatums, responding to the regime’s repeated requests for modifications to the plan as the death toll mounted. The Assad regime was criticized for using delaying tactics, and the international community put increasing pressure on the League to stand firm. The decision to suspend Syria, one of the League’s founding members, was eventually approved but then repeatedly delayed, as were economic sanctions. Russia’s decision to press Syria with a UNSC resolution was the tipping point that convinced Syria to finally agree to allow observers into the country. On January 9, a group of observers were attacked by Assad supporters in the port city of Latakia and in the eastern city of Deir al-Zour. Eleven monitors were slightly wounded in Latakia when thousands surrounded their car, protesting the mission and chanting pro-Assad slogans.76 One armored car was “completely crushed,” according to Dabi’s report. Elaraby condemned the attack and blamed the Syrian government for not providing adequate security. The Syrian government formally apologized for the incident and claimed that the events were not deliberate.77 However, the following day Assad fanned the flames in a speech at Damascus University in which he ridiculed the Arab League and even dismissed the Gulf states as lacking culture.78 Several monitors also resigned from the mission, including Anwar Malek of Algeria, who said in an interview with Al Jazeera that the mission “was a farce … the regime orchestrated it and fabricated most of what we saw to stop the Arab League from taking action against the regime.”79 He claimed that the Assad regime had not met any of the conditions in the League plan. (L-R) Joint Special Envoy for Syria and former United Nations (UN) Secretary General Kofi Annan, UN Secretary General Ban Ki-Moon and Dr. Nabil El-Araby, Secretary-General, League of Arab States, speak during a news conference after the UN Security Council held consultations regarding the UN Supervision Mission in Syria on June 7, 2012 at United Nations Headquarters in New York City. Earlier today, UN monitors were shot at in Syria when they attempted to visit the scene of a reported massacre in Hama province. Source: Andrew Burton/Getty Images. The Arab League’s poorly conceived and planned engagement was a failure and did little to encourage future efforts to prevent conflict. Some minimal levels of planning and competence will be required if any such future initiatives come to fruition. Even though no amount of competence and capacity could have overcome the challenges presented by Syria’s collapse into multisided civil and proxy war, it is not surprising that Assad was able to defy the Arab League without any consequence. His regime’s interactions with the UN in subsequent years were also marked by bureaucratic stalling techniques, threats of violence against international observers and workers, and insincere pledges that international bodies, by design, were obligated to take seriously. But the fact that even the League’s initial steps were marred by dubious personnel choices, rudimentary mission design, and insufficient capacity are a warning sign for future engagements and deployments. Further, the haphazard, ad hoc fashion in which this mission was designed and implemented left little imprint on the organization and did little to prepare it for future challenges. Some of the challenges facing the Middle East are by no means unique. Other loose security communities and similarly situated organizations have sought to create conflict prevention mechanisms and structures. These comparative experiences demonstrate the kinds of efforts that may be applicable in the Middle East and the ways in which the building of institutions and the establishment of conflict prevention mechanisms may provide a platform for future actions. 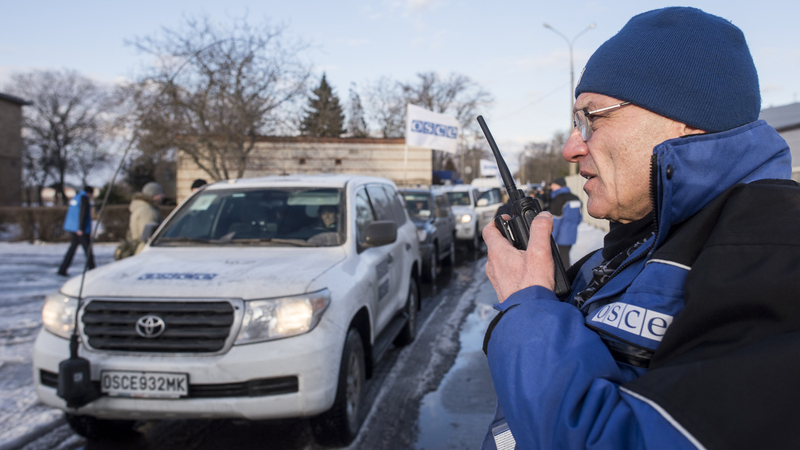 OSCE monitors getting ready for patrol in the area of Mariupol, eastern Ukraine, in January 2018. Source: OSCE/Evgeniy Maloletka. In thinking about potential future scenarios within the region, particularly with respect to the Middle East’s ongoing crises, it is worth considering potential opportunities for collaborative capacity-building with other multilateral organizations even if such efforts are deliberately limited at the outset. Despite these formal linkages and regular calls for further institutionalizing cooperation between the two organizations, very little practical collaboration has taken place: “We have to move away from the general political statements that have characterized this relationship and start dealing with practical considerations. We have Libya, Sudan, and Somalia, and yet very little has been done to establish mechanisms for institutional cooperation. That is a major missed opportunity and gap.”113 The rising tensions between Egypt and Ethiopia over the construction of the Great Ethiopian Renaissance Dam and the possibility of reduced water flow to Egypt114 are another potential flashpoint that could benefit from closer cooperation. This sort of arrangement would also help neutralize some of the political sensitivities that often accompany cooperation with other multilateral organizations, particularly Western organizations. It might also provide a less politically sensitive conduit for indirect funding coordinated through the African Union.115 Although the lack of political will is clearly the primary obstacle to institutionalizing capacity at the Arab League, controversies within the organization regarding funding levels and support certainly undermine any nascent efforts to do so. Another potential opportunity may arise with respect to some of the region’s most intractable conflicts, such as those in Libya and Syria. Although the complexity of these conflicts, the associated regional interests, and the preponderant role of major outside countries limit opportunities for regional engagement, creative efforts might allow for some degree of regional involvement. Writing in 2012, Richard Gowan noted that “it is conceivable that the Arab League could find itself in charge of a military deployment long before it is ready to do so.”116 The Arab League has previously deployed peacekeeping forces. In 1961, following Kuwait’s independence from Great Britain and rising tensions with Iraq stemming from Iraqi territorial claims,117 Great Britain sought to deter Iraqi action by mobilizing its own forces. Iraq then agreed not to attack Kuwait if the British forces withdrew.118 The League subsequently deployed a force of 2,337 and helped avert an Iraqi military attack, although Iraq never fully conceded its original territorial claims.119 In 1976, the Arab League authorized the deployment of the Arab Deterrent Force, which sought to implement a cease-fire to stem further escalation of Lebanon’s growing civil war.120 Syrian troops had already entered Lebanon, but their presence was formalized by incorporation into the Arab League force. The original deployment of 25,100 included troops from Libya, Saudi Arabia, South Yemen, Sudan, and the United Arab Emirates.121 Starting with Libya in 1976, the contributing countries began pulling their forces out of Lebanon, and by the spring of 1979 all of the contributors but Syria had left Lebanon.122 Syrian forces would remain in Lebanon, to disastrous effect, until 2005. More recent events have rendered the possibility of an Arab League deployment less likely, but serious consideration should be given to involving the Arab League in potential future UN peacekeeping operations in crisis areas.123 As UN political missions already exist and have taken a leading role in both Syria and Libya, future focus could consider a possible hybrid peacekeeping mission. In practice, the Arab League would not make an expansive contribution to any sort of hybrid mission, but rather would provide consultation and collaboration in the planning phases. This sort of joint mission would provide opportunities for involving Arab League personnel and, more important, would give the Arab League exposure to the planning and deployment of a complex peacekeeping mission. In addition to building regional support for UN efforts, such active hybrid cooperation would be an important capacity-building opportunity. Previous opportunities for that sort of collaboration, however, have been eschewed. In February 2012, the UN and the Arab League appointed former UN secretary-general Kofi Annan as the joint special envoy of the UN and the Arab League on the Syrian crisis, following the suspension of the League observer mission in Syria.124 Several weeks after the initial announcement, the UN and the Arab League appointed Nasser al-Kidwa as deputy joint special envoy of the UN and the League of Arab States on Syria. Kidwa, a veteran Palestinian diplomat who had previously served as the minister for Foreign Affairs of the Palestinian National Authority,125 led much of the initial work with the Syrian opposition and efforts to expand their organizational umbrella, assisted by several staff members who were effectively appointed by the Arab League.126 In practice, however, the mission functioned as a UN mission and the Arab League’s institutional involvement was symbolic.127 As a former member of the mission noted, “The role of the League was more symbolic and political than operational. The notion of a joint mission provided legitimacy and continuity that was seen as needed in 2012 due to the UN principle of subsidiarity and the leading role the League had played in the crisis since August 2011, which needed to be respected given the interest in developing a united international response.” This remained the case despite the subsequent appointment of the distinguished Arab League and UN diplomat Lakhdar Brahimi as Annan’s successor in August of the same year.128 As a result, the effort was a missed opportunity for limited but potentially useful forms of collaboration and capacity building. Future opportunities for this kind of cooperation with the United Nations would be particularly salient for the Middle East because the region’s conflicts have required a disproportionate involvement of the United Nations in general and of the UN Security Council in particular. The Middle East also occupies a disproportionate share of the foreign policy focus of the United States, Europe, and Russia. The EU has taken various small steps to establish mechanisms for institutional engagement with the Arab League. Prior to 2012, and despite some institutional contacts, relations were not governed by any structures and were mostly ad hoc.129 Following the 2011 Arab uprisings, the EU and its member states became more interested in formalizing interactions with the Arab League, and in November 2012 EU and Arab League foreign ministers met in Cairo and issued a joint political declaration that established a periodic meeting structure at ministerial, ambassadorial, and senior official levels, with the aim of institutionalizing contacts between the organizations.130 In 2014, the EU and the Arab League established a strategic dialogue focused on regional security issues. As part of the 2012 meeting, they also agreed to a work program. The most notable outcome of that agreement on sectoral cooperation has been the assistance provided by the European External Action Service to build a situation room for crisis management.131 The impetus for this initiative was twofold. First, it was meant to create a direct line of communication between European diplomats and actors on the ground. As a senior European official noted at the time, “If there is a terrorist attack, for instance, we need to know who to talk to. We have had huge difficulties in the past to find out exactly what is happening with European citizens on the ground. . . . We need reliable people on the other side of the line.”132 Second, it sought to build out the Arab League’s crisis management infrastructure, including the provision of basic equipment such as computers, screens, and satellite communications.133 The stated expectation was that Arab countries, in the first instance, and Europeans would create linkages with the facility to develop a regional center that would collect information in crisis situations.134 The incremental construction of this sort of institutional infrastructure may have humble ambitions, but it can form a basis for expansion and provide a platform for coordinating future crisis management and conflict prevention actions. Other efforts at institutional collaboration, including with the World Bank, the OSCE, and the Organization of Islamic Cooperation, offer additional pathways to potentially productive activities and cooperation. However, in light of the Arab League’s current capacity and historical track record, it is unlikely that it will proactively seek opportunities to meaningfully contribute to “plug-and-play” peace operations,136 in which international and regional organizations contribute relevant assets in an ad hoc fashion without centralized structures. Instead, to overcome the political and organizational impediments to participation, interested parties and advocates within and outside the region would need to actively propose such novel structures and seek out even limited Arab League involvement. Not all efforts at capacity–building need be housed within the Arab League, although it remains the region’s primary focus for regional diplomacy and conflict prevention. Building up a cadre of trained professionals is an important step in any case, and the Arab world has existing organizations that can undertake much of that work. These organizations also represent a convenient point of contact for external funders, which provide a significant portion of their operating budget. Two such examples are the Cairo International Center for Conflict Resolution, Peacekeeping and Peacebuilding (CCCPA) in Egypt and the Peace Operations Training Center (POTC) in Jordan. Any regional security dialogue or institutionalization of conflict prevention mechanisms in the Middle East will have to confront the challenge of how and when to incorporate non-Arab states. Despite the significant hurdles to such engagement, failure to engage will limit the effectiveness and reach of conflict prevention efforts. A cursory examination of the region’s current conflicts and geopolitical divides makes it clear that non-Arab states are important players in and at times are the most significant drivers of conflict. Their eventual inclusion in regional security efforts will be critical to conflict mediation and resolution initiatives and future conflict prevention. This process, particularly at the level of the Arab League, will likely lag behind the efforts of individual countries that may be more proactive in engaging non-Arab parties on regional security matters. Such engagement continues to occur in ad hoc ways, including through myriad Track Two initiatives,139 but the political constraints on the Arab League mean that its formal participation will hinge on major regional shifts. This reality is exemplified by the Arab League’s involvement with the Arab Peace Initiative, which was announced in Beirut at the Arab League Summit in March 2002.140 The initiative was sponsored by Saudi Arabia and offered to extend Arab recognition of Israel, normalize ties with it, and end the Arab-Israeli conflict following the completion of a two-state solution and the establishment of a Palestinian state in the occupied territories. The initiative was taken up again at the 2007 Arab League summit in Riyadh.141 Although the initiative represents a major shift in Arab approaches to the conflict, its contingent and collective nature suggests that the Arab League will have space and license to engage with non-Arab regional countries only in the wake of conflict cessation and regionalized normalization. The impediments to engaging with Turkey and Iran are not as structural in nature as those with respect to Israel, but they remain daunting. Nonetheless, the Arab League should be included, as appropriate, in regional Track Two initiatives. There is wide scope for such inclusion, particularly on technical regional security matters. In aspirational terms, the Arab League would extend observer status to non-Arab regional states. In regional security terms, inclusion of those countries in a more formal capacity would represent a much later and mature stage of any effort at institutionalizing a robust, serious regional security architecture. Regional political realities and the elevation of state sovereignty above all other considerations have and will continue to hinder the institutionalization of conflict prevention structures and mechanisms. Despite understandable skepticism about the utility and feasibility of institution-building, particularly at an acute moment of reactionary sentiment and regionalized conflict, there is space for incremental yet constructive steps to build regional capacity for conflict prevention, crisis management, and postconflict reconstruction. The need is severe and will remain so for years. Several conflict-stricken countries in the region, such as Libya, Syria, and Yemen, likely will require extended external support for years to come. That support may not be limited to conflict mediation and resolution efforts, but could encompass prosaic but critical field and technical operations such as disarmament and destruction of small arms, light weapons, and conventional ammunition. Whether as a result of opportunism, major shifts in the Middle East’s geopolitics, or the emergence of greater dynamism within the Arab League’s leadership, the opportunity to actively engage with the region’s conflicts may arise or be forced upon regional organizations. Yet without some degree of preparatory institution- and capacity-building, the region will again be poorly prepared to deal with such challenges, as the ill-fated Arab League observer mission in Syria disastrously demonstrated. To avoid a repeat of that scenario, regional and international parties must begin that longer-term process of preparation. In 2008, the Arab League, through the offices of then Secretary-General Amr Moussa, was unexpectedly able to contribute to the resolution of Lebanon’s presidential crisis. That effort, enabled by the Arab Peace and Security Council, demonstrates the ways in which institutional reform can have small but positive impacts.142 More recent efforts at Arab League mediation in 2009 in Yemen and in 2009–2010 between Egypt and Algeria were rejected by the parties,143 and reflect the abiding reality that mediation still requires the consent of the parties involved. The Arab League’s difficulties in building cooperative security frameworks are well known. As James Worrall notes, doing so “between 22 diverse states with widely differing levels of economic success, different political systems, and [a] whole host of external alliances, which have linked the region to wider geopolitical struggles” has proven difficult.144 It is far too easy to mock and lament the state of the Arab League and the Middle East’s other multilateral regional organizations. But as with the region’s politics and geopolitics, pessimism, defeatism, and apathy do not make for a prudent course of policy action. Cover image: Arab foreign ministers meet at the Arab League November 10, 2002 in Cairo, Egypt. The ministers were meeting to discuss the new United Nations resolution on disarming Iraq. Source: Norbert Schiller/Getty Images. Rosie Gray, “Was Mohamed Morsi Literally Asleep at the Arab League Summit?” BuzzFeed, March 16, 2013, https://www.buzzfeed.com/rosiegray/was-mohamed-morsi-­literally-asleep-at-the-arab-league-summit?utm_term=.au442K0QV#.xa1JkBLN3; Mahmoud Eskaf, “Photos: Arab Leader Sleeping during Arab League Summit,” Middle East Observer, July 26, 2016, https://www.middleeastobserver.org/2016/07/26/photos-arab-leader-sleeping-­during-arab-league-summit/; and Rose Troup Buchanan, “A Bunch of World Leaders Fell Asleep at This International Summit and the Photos are Amazing,” BuzzFeed, March 30, 2017, https://www.buzzfeed.com/rosebuchanan/not-woke?utm_term=.xuROXRkKy#.jknmjkKdR. See, e.g., Michael Barnett and Etel Solingen, “Designed to Fail or Failure to Design? The Origins and Legacy of the Arab League,” in Crafting Cooperation: Regional Institutions in Comparative Perspective, eds. Amitav Acharya and Alastair Iain Johnston (Cambridge, UK: Cambridge University Press, 2007), 180–220; Farah Dakhlallah, “The League of Arab States and Regional Security: Towards an Arab Security Community?” British Journal of Middle Eastern Studies 39, no. 3 (2012): 393–412; and Marco Pinfari, “Nothing but Failure? The Arab League and the Gulf Cooperation Council as Mediators in Middle Eastern Conflicts,” Crisis States Working Papers Series no. 2, Working Paper no. 45, Crisis States Research Centre, London School of Economics and Political Science, 2009, http://www.lse.ac.uk/internationalDevelopment/research/crisisStates/download/wp/wpSeries2/WP452.pdf. Barnett and Solingen, “Designed to Fail or Failure to Design?” 180 (footnote omitted). Dakhlallah, “The League of Arab States and Regional Security,” 393. James Worrall, International Institutions of the Middle East: The GCC, Arab League, and Arab Maghreb Union (London: Routledge, 2017). The Arab League comprises (in order of accession) Egypt, Iraq, Jordan, Lebanon, Saudi Arabia, Syria, Yemen, Libya, Sudan, Morocco, Tunisia, Kuwait, Algeria, Bahrain, Qatar, Oman, the United Arab Emirates, Mauritania, Somalia, Palestine, Djibouti, and the Comoros. Based on its charter, membership in the organization is open to every independent Arab State. Eritrea, Brazil, Venezuela, and India have observer status. Charter of Arab League, League of Arab States, Article 2, March 22, 1945, available at http://www.refworld.org/docid/3ae6b3ab18.html (full original text, in translation; accessed October 30, 2017); original Arabic version available at http://www.lasportal.org/ar/aboutlas/Documents/ميثـاق%20جامعة%20الدول%20العربية%20و%20ملحقاته%20.pdf. The charter further enumerates the potential scope of the League’s activities, including “close co-operation of the member States with due regard to the structure of each of these States and the conditions prevailing therein, in the following matters: (a) Economic and financial matters, including trade, customs, currency, agriculture and industry; (b) Communications, including railways, roads, aviation, navigation, and posts and telegraphs; (c) Cultural matters; (d) Matters connected with nationality, passports, visas, execution of judgments and extradition; (e) Social welfare matters; (f) Health matters.” Ibid. Barnett and Solingen, “Designed to Fail or Failure to Design?” 181. Malcolm Kerr, The Arab Cold War, 1958–1967: A Study of Ideology in Politics (London and New York: Oxford University Press, 1967). Charter of Arab League, Article 7. The one exception to this rule of unanimity is in the case of aggression committed by a member state against another member state, in which case the vote of the aggressor state will not be counted in determining unanimity. Ibid., Article 6. Worrall, International Institutions of the Middle East, 47. Worrall notes that the Charter of the Arab League has only twenty articles and three short annexes. In contrast, he highlights that the Charter of the United Nations includes 111 articles and nineteen chapters. Charter of Arab League, Article 5. Hesham Youssef, “Mediation and Conflict Resolution in the Arab World: The Role of the Arab League,” Yearbook on the Organization for Security and Co-operation in Europe (OSCE), ed. Institut für Friedensforschung und Sicherheitspolitik an der Universität Hamburg (London: Bloomsbury, 2013), 300. “Tensions between Arab States are legion but they are often expressed more through rhetoric, posturing or by covert participation in proxy wars than by invasion and or direct conflict.” Worrall, International Institutions of the Middle East, 57. Pinfari, “Nothing but Failure?,” 12. Dakhlallah, “The League of Arab States and Regional Security,” 411. Worrall, International Institutions of the Middle East, 65. “‘Until now, the Arab League has been a forum for dialogue but has never really intervened in regional conflicts except on a very high political level and through the Offices of the Secretary General.’” Dakhlallah, quoting Dr. Saeed al-Boromi, then the director of the Arab Peace and Security Council, in “The League of Arab States and Regional Security,” 411. Worrall, International Institutions of the Middle East, 66. Pinfari, “Nothing but Failure?” 15-16. F. Gregory Gause III, The International Relations of the Persian Gulf, (New York: Cambridge University Press, 2010), 57. Claude Rakisits, “The Gulf Crisis: Failure of Preventive Diplomacy,” in Building International Community, ed. Kevin Clements and Robin Ward (St. Leonards, Australia: Allen and Unwin, 1994), 58. Gause, The International Relations of the Persian Gulf, 89. Michael Wahid Hanna, “The Arab League: First Steps toward New Norms,” World Politics Review, May 22, 2012, https://www.worldpoliticsreview.com/articles/11978/the-arab-league-first-steps-toward-new-norms. Former senior Arab League official, interview with the author, October 2, 2017. “Arab League Parliament Urges Syria Suspension,” Al Jazeera English, September 20, 2011, http://www.aljazeera.com/news/middleeast/2011/09/201192017594330402.html. “Arab League: Deploy Civilian Monitors in Syria,” Human Rights Watch, October 26, 2011, https://www.hrw.org/news/2011/10/26/arab-league-deploy-civilian-monitors-syria. Nada Bakri, “Defectors Claim Attack that Killed Syria Soldiers,” New York Times, October 26, 2011, http://www.nytimes.com/2011/10/27/world/middleeast/army-defectors-in-syria-take-credit-for-deadly-attack.html?rref=collection%2Ftimestopic%2FArab%20League. Liz Sly, “Arab League Announces Peace Plan for Syria,” Washington Post, November 2, 2011, https://www.washingtonpost.com/world/middle_east/arab-league-announces-peace-plan-for-syria/2011/11/02/gIQAKBm6fM_story.html. Anthony Shadid, “TimesCast November 11, 2011,” New York Times, November 11, 2011, https://www.nytimes.com/video/multimedia/100000001166407/timescast–november-­11-2011.html?rref=collection%2Ftimestopic%2FArab%20League. Nada Bakri, “Protesters Urge Arab League to Suspend Syria as Deaths Mount,” New York Times, November 11, 2011, http://www.nytimes.com/2011/11/12/world/middleeast/syrian-­protesters-killed-during-street-protests-demanding-arab-league-suspend-syria.html?rref=collection%2Ftimestopic%2FArab%20League. Neil MacFarquhar, “Arab League Votes to Suspend Syria over Crackdown,” New York Times, November 12, 2011, http://www.nytimes.com/2011/11/13/world/middleeast/arab-league-votes-to-suspend-syria-over-its-crackdown-on-protesters.html. David Batty and Jack Shenker, “Syria Suspended from Arab League,” Guardian, November 12, 2011, https://www.theguardian.com/world/2011/nov/12/syria-suspended-arab-league. Anthony Shadid, “TimesCast November 16, 2011,” New York Times, November 16, 2011, https://www.nytimes.com/video/multimedia/100000001175056/timescast–november-­16-2011-.html?rref=collection%2Ftimestopic%2FArab%20League. “Arab League Extends Syria Deadline,” Al Jazeera English, November 17, 2011, http://www.aljazeera.com/news/middleeast/2011/11/20111116194842696136.html. Nada Bakri, “New Calls to Press Syria from France and Turkey,” New York Times, November 18, 2011, http://www.nytimes.com/2011/11/19/world/middleeast/france-and-­turkey-call-for-more-pressure-on-syria.html?rref=collection%2Ftimestopic%2FArab%20League. Nada Bakri, “League Warns Syria to Admit Monitors or Risk Sanctions,” New York Times, November 24, 2011, http://www.nytimes.com/2011/11/25/world/middleeast/arab-league-warns-syria-of-sanctions-deadline.html?rref=collection%2Ftimestopic%2FArab%20League. Neil MacFarquhar and Nada Bakri, “Isolating Syria, Arab League Imposes Broad Sanctions,” New York Times, November 27, 2011, http://www.nytimes.com/2011/11/28/world/middleeast/arab-league-prepares-to-vote-on-syrian-sanctions.html?rref=collection%2Ftimestopic%2FArab%20League. “Arab League Sanctions for Syria,” BBC News, November 12, 2011, http://www.bbc.com/news/world-middle-east-15706851. Nada Bakri, “Syria Offers to Allow Observers, With Strings,” New York Times, December 5, 2011, http://www.nytimes.com/2011/12/06/world/middleeast/syria-says-it-will-allow-arab-observer-mission.html?rref=collection%2Ftimestopic%2FArab%20League. Nada Bakri, “Impatient Protesters Convulse Syria as Russia Offers New Resolution,” New York Times, December 16, 2011, http://www.nytimes.com/2011/12/17/world/middleeast/impatient-protesters-convulse-syria-as-russia-offers-new-resolution.html?rref=collection%2Ftimestopic%2FArab%20League. “Syria Signs Deal to Allow Arab League Observers into Country,” Associated Press, December 19, 2011, https://www.theguardian.com/world/2011/dec/19/syria-to-admit-arab-league-observers. David Kenner, “The World’s Worst Human Rights Observer,” Foreign Policy, December 27, 2011, http://foreignpolicy.com/2011/12/27/the-worlds-worst-human-rights-observer/. Former senior Arab League official, interview. Erika Solomon and Mariam Karouny, “Seventeen Dead as Syrians Stage Mass Protests,” Reuters, December 30, 2011, http://www.reuters.com/article/us-syria/seventeen-dead-as-­syrians-stage-mass-protests-idUSTRE7BO0B620111230. “Arab League Monitors Visit Besieged Syrian City,” NPR, December 27, 2011, http://www.npr.org/templates/transcript/transcript.php?storyId=144335720. “Report of the Head of the League of Arab States Observer Mission to Syria for the Period from 24 December 2011 to 18 January 2012,” League of Arab States Observer Mission to Syria, January 27, 2012, http://www.columbia.edu/~hauben/Report_of_Arab_League_Observer_Mission.pdf. Erika Solomon, “Arab Mission’s View of Syrian Town Angers Locals,” Reuters, December 28, 2011, http://www.reuters.com/article/us-syria-delegation/arab-missions-view-of-­syrian-town-angers-locals-idUSTRE7BR0AZ20111228. Robert Mackey, “Observers Confronted with Anger, Gunshots and a Dead Child in Syria,” New York Times, December 28, 2011, https://thelede.blogs.nytimes.com/2011/12/28/observers-confronted-with-anger-gunshots-and-a-dead-child-in-syria/?_r=0. Kareem Fahim, “Violence Flares in Syria Despite Observers’ Visit,” New York Times, December 28, 2011, http://www.nytimes.com/2011/12/29/world/middleeast/violence-flares-in-syria-despite-arab-league-observers.html. Kareem Fahim and Hwaida Saad, “Arab League Has Led to More Violence in Syria, Activists Say,” December 29, 2011, http://www.nytimes.com/2011/12/30/world/middleeast/syria-observers-face-more-criticism.html. Kareem Fahim and Hwaida Saad, “Thousands Rally in Syria to Prove Their Discontent to Arab Monitors,” New York Times, December 30, 2011, http://www.nytimes.com/2011/12/31/world/middleeast/new-clashes-in-syria-as-monitors-mission-challenged.html. “Arab Group Wants to Pull Syria Monitors,” Associated Press, January 1, 2012, http://www.nytimes.com/2012/01/02/world/middleeast/arab-group-wants-to-pull-syria-monitors.html. Adrian Blomfield, “Syria: Arab League Secretary General Concedes Monitors Have Failed to Stop Killings,” Telegraph, January 2, 2012, http://www.telegraph.co.uk/news/worldnews/middleeast/syria/8988475/Syria-Arab-League-secretary-general-concedes-monitors-have-failed-to-stop-killings.html. Kareem Fahim, “Chief of Arab League’s Mission in Syria Is Lightning Rod for Criticism,” New York Times, January 2, 2012, http://www.nytimes.com/2012/01/03/world/middleeast/arab-league-criticized-over-syria-observer-mission.html. Kareem Fahim, “Syria Killings Continue; Group to Add Observers,” New York Times, January 3, 2012, http://www.nytimes.com/2012/01/04/world/middleeast/syria-killings-­continue-despite-observers.html. Abigail Fielding-Smith and Roula Khalaf, “Arab League Role in Syria Questioned,” Financial Times, January 5, 2012, https://www.ft.com/content/95d604ac-37c8-11e1-a5e0-00144feabdc0?mhq5j=e6. Mayy El Sheikh and Nada Bakri, “Observers Appeal Again to Syria,” New York Times, January 8, 2012, http://www.nytimes.com/2012/01/09/world/middleeast/observers-appeal-again-to-syria.html. “Arab League Condemns Attacks on Observers,” Al Jazeera, January 10, 2012, http://www.aljazeera.com/news/middleeast/2012/01/2012110161431310753.html. Anthony Shadid, “Syrian Leader Vows ‘Iron Fist’ to Crush ‘Conspiracy,’” New York Times, January 11, 2012, http://www.nytimes.com/2012/01/11/world/middleeast/syrian-leader-vows-to-crush-conspiracy.html. “Arab Observer Says Syrian Mission a Farce,” Al Jazeera English, January 10, 2012, https://www.youtube.com/watch?feature=player_embedded&v=rrq1RICYvuw. Anthony Shadid, “As Syria Offers Amnesty, U.N. Urges End to Killing,” New York Times, January 15, 2012, http://www.nytimes.com/2012/01/16/world/middleeast/syria-issues-amnesty-as-un-calls-for-end-to-violence.html. Kareem Fahim, “In Syrian City, a Calm that Few Expect to Last,” New York Times, January 21, 2012, http://www.nytimes.com/2012/01/22/world/middleeast/blasts-kill-at-least-14-on-syrian-police-truck.html. Nada Bakri, “At Least 34 People Killed in Syria as Monitors Fail to Quell Violence,” New York Times, January 17, 2011, http://www.nytimes.com/2012/01/18/world/middleeast/new-wave-of-killings-in-syria.html. “Arab Monitoring Head Says Violence Dipped in Syria,” Reuters, January 23, 2012, https://www.reuters.com/article/uk-syria-monitors-dabi/arab-monitoring-head-says-violence-dipped-in-syria-idUKTRE80M0U920120123. Kareem Fahim, “Arab League Floats Ambitious New Peace Plan for Syria,” New York Times, January 22, 2012, http://www.nytimes.com/2012/01/23/world/middleeast/arab-league-floats-new-peace-plan-for-syria.html. Kareem Fahim, “Stalemate Deals Grief and Fury in Syria,” New York Times, January 23, 2012, http://www.nytimes.com/2012/01/24/world/middleeast/syria-reportedly-rejects-arab-league-peace-plan.html. Ayman Samir and Yasmine Saleh, “Saudi Urges Pressure on Syria, Withdraws Monitors,” Reuters, January 22, 2012, http://www.thestar.com.my/news/world/2012/01/22/saudi-urges-pressure-on-syria-withdraws-monitors/. “Arab League Suspends Syria mission—Nabil el-Arabi,” BBC News, January 28, 2012, http://www.bbc.com/news/world-middle-east-16774171. Kareem Fahim and Nada Bakri, “Sharp Rise in Violence Halts Monitoring by League in Syria,” New York Times, January 28, 2012, http://www.nytimes.com/2012/01/29/world/middleeast/arab-league-suspends-its-monitoring-in-syria.html. “Security Council Members Diverge over Path towards Implementation of Draft Resolution Backing Arab League Proposal on Resolving Crisis in Syria,” Meetings Coverage, UNSC, 6710th Meeting, https://www.un.org/press/en/2012/sc10534.doc.htm. “ASEAN Political-Security Community Blueprint 2025,” ASEAN Secretariat, March 2016, http://www.asean.org/wp-content/uploads/2012/05/ASEAN-APSC-Blueprint-2025.pdf. “The ASEAN Institute for Peace and Reconciliation and Its Role in Preventing Crises,” UN Chronicle, 54, no. 3 (October 2017), https://unchronicle.un.org/article/asean-institute-peace-and-reconciliation-and-its-role-preventing-crises. “The OSCE Conflict Prevention Centre,” OSCE Factsheet, Organization for Security and Co-operation in Europe, accessed October 25, 2017, http://www.osce.org/cpc/13717?download=true. UN Regional Centre for Preventive Diplomacy for Central Asia (UNRCCA) website, accessed October 25, 2017, https://unrcca.unmissions.org/. Richard Gowan, “Multilateral Political Missions and Preventive Diplomacy,” Special Report, United Nations Institute of Peace, no. 299 (December 2011), https://www.usip.org/sites/default/files/resources/SR299.pdf. Pinfari, “Nothing but Failure?” 18. United Nations General Assembly, thirty-second session, March 17, 1977, https://unispal.un.org/DPA/DPR/unispal.nsf/0/97F79F017B276FB085256FDB006E4C08. Olusola Ojo, “The Relationship between the Organization of African Unity and the League of Arab States,” Africa Spectrum 16, no. 2 (1981): 138. Hanspeter Mattes, “Aftermath of the Sirte Summit: Arab-African Cooperation on the Upswing?” GIGA Focus, German Institute of Global and Area Studies, no. 6 (2010): 3, https://www.giga-hamburg.de/en/system/files/publications/gf_international_1006.pdf. “Sirte Declaration,” The Second Africa-Arab Summit, Sirte, Libya, October 10, 2010, http://www.iri.edu.ar/publicaciones_iri/anuario/cd_anuario_2011/Demo/Nueva%20carpeta/The%20Second%20Africa%20Arab%20Summit%20Sirte%20Declaration.pdf. Mattes, “Aftermath of the Sirte Summit,” 6. Report of the UN Secretary-General, Support to African Union peacekeeping operations authorized by the United Nations, A/65/510- S/2010/514, October 14, 2010, paragraph 53, http://www.un.org/ga/search/view_doc.asp?symbol=S/2010/514. “Kuwait Declaration,” Third Africa-Arab Summit, October 19–20, 2013, https://au.int/en/documents/30952/kuwait-declaration. “Arab-Africa Summit Aims to Promote Ties,” Al Jazeera, November 19, 2013, http://www.aljazeera.com/news/middleeast/2013/11/arab-africa-summit-aims-promote-ties-2013111961914751979.html. “Consultations between the African Union and the League of Arab States on Political, Peace and Security Issues,” African Union and the League of Arab States, December 1, 2015, http://www.peaceau.org/uploads/auc-joint-press-release-auc-las-1-12-2015-1-.pdf. “Joint Communique by League of Arab States, African Union and United Nations (UNSMIL),” ReliefWeb, October 25, 2016, https://reliefweb.int/report/libya/joint-communiqu-league-arab-states-african-union-and-united-nations-unsmil. “European Union, African Union, League of Arab States, and United Nations—Joint Communique,” United Nations Support Mission in Libya, May 23, 2017, https://unsmil.unmissions.org/european-union-african-union-league-arab-states-and-united-nations-joint-communique. “Morocco and Partners Quit Africa-Arab Summit over Polisario Attendance,” New Arab, November 23, 2016, https://www.alaraby.co.uk/english/news/2016/11/23/morocco-and-partners-quit-africa-arab-summit-over-polisario-attendance. “Malabo Declaration,” Fourth Africa-Arab Summit, November 23, 2016, Malabo, Equatorial Guinea, http://www.resakss.org/sites/default/files/Malabo%20Declaration%20on%20Agriculture_2014_11%2026-.pdf. Senior Egyptian diplomat, interview with the author, October 10, 2017. Michele Dunne and Katherine Pollock, “River of Discontent,” Carnegie Middle East Center, October 23, 2017, http://carnegie-mec.org/diwan/73491?lang=en. Richard Gowan, “The Case for Cooperation in Crisis Management,” European Council on Foreign Relations, June 2012, 5. Youssef, “Mediation and Conflict Resolution in the Arab World,” 301. Ibid. The Arab League deployment included 1,281 troops from Saudi Arabia, 785 from Jordan, 159 from the United Arab Republic, and 112 from Sudan. Ibid. Whether the Arab League is a Chapter VIII regional organization remains ambiguous. Chapter VIII of the UN Charter provides the basis for the involvement of regional organizations in maintaining international peace and security, despite the fact that UNSC has primary responsibility for those efforts. Despite this ambiguity, the League’s “normative and de facto status means that it can be considered a Chapter VIII body.” Worrall, International Institutions of the Middle East, 59. Joint statement by the secretaries-general of the United Nations and of the League of Arab States on appointment of Kofi Annan as Joint Special Envoy on the Syrian crisis, February 23, 2012, https://www.un.org/sg/en/content/sg/statement/2012-02-23/joint-statement-secretaries-general-united-nations-and-league-arab. “Nasser al-Kidwa Appointed Deputy Joint Special Envoy of United Nations, League of Arab States on Syria,” March 7, 2012, https://www.un.org/press/en/2012/sga1330.doc.htm. Former United Nations official, email correspondence with the author, October 25, 2017. Former senior United Nations official, email correspondence with the author, October 17, 2017. “Secretary-General Announces Appointment of Lakhdar Brahimi as Joint Arab League-United Nations Special Representative for Syria,” United Nations, August 17, 2012, https://www.un.org/press/en/2012/sgsm14471.doc.htm. Following Brahimi’s resignation, Staffan de Mistura was appointed as Brahimi’s successor in July 2014. Reflecting practical realities, however, de Mistura’s appointment was undertaken solely by the United Nations. “Secretary-General Appoints Staffan de Mistura Special Envoy for Syria, Ramzy Ezzeldin Ramzy Deputy Special Envoy for Syria,” United Nations, July 10, 2014, https://www.un.org/press/en/2014/sga1480.doc.htm. Elisabeth Johansson-Nogués, “The New EU-Arab League Dialogue: The Contours of a Cooperation,” Mediterranean Politics 20, no. 2 (2015): 295–302. Johansson-Nogués, “The New EU-Arab League Dialogue,” 297. Andrew Rettman, “EU Builds Situation Room for Arab League in Cairo,” EU Observer, June 26, 2012, https://euobserver.com/foreign/116757. Ibid. Included as part of this assistance was open-source intelligence-monitoring and scenario-planning software that had previously been developed for use by the European Commission. Senior Egyptian diplomat, interview with the author. Gowan, “The Case for Cooperation in Crisis Management,” 2. Cairo International Center for Conflict Resolution, Peacekeeping and Peacebuilding website, accessed October 25, 2017, http://www.cairopeacekeeping.org. Peace Operations Training Center (POTC) of Jordan website, accessed October 25, 2017, http://www.potc.mil.jo. Track Two diplomacy is unofficial dialogue between regional experts, which might eventually influence policymakers. Worrall, International Institutions of the Middle East, 64. Youssef, “Mediation and Conflict Resolution in the Arab World,” 303.